Place the yogurt in a breakfast bowl and mix with the coffee, vanilla, honey and stir well. Taste and adjust the sweetness. Sprinkle with coco powder and serve immediately. To cook 1 cup of quinoa: wash the quinoa under the faucet until it foams. Pour into a medium pot with two cups of water. Cook at medium-high heat until it begins to boil. Let cook at low and cook for 15 minutes, until the water has been absorbed. Stir the quinoa with a fork and let cool. Refrigerate. In my house, we're divided into 2 groups: those who love toast for breakfast and those who only accept cereal. On the weekends everyone wants something different and special, so we like to play with the ingredients in our favorite desserts to flavor our cereals. 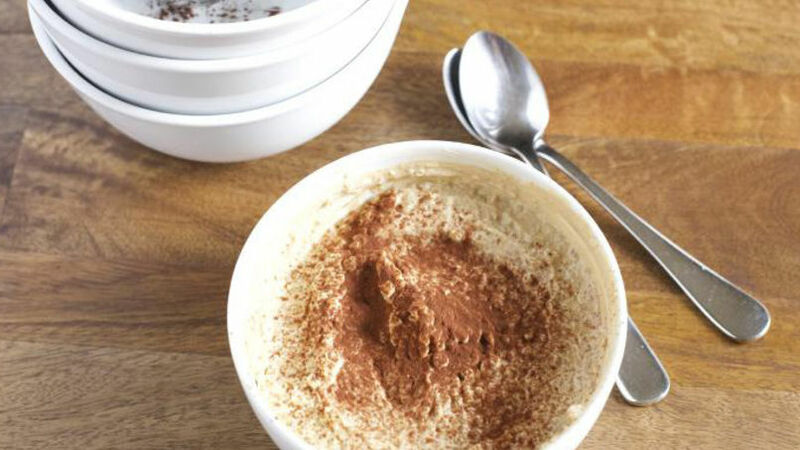 This tiramisu recipe is absolutely delicious. You should precook the quinoa the day before so it's cold and ready for breakfast.